Subject: Battle Brush Studios' Commission Painting Log - Massive update! 40k, WHFB, Historicals, Infinity, .. I recently started my commission painting service properly and thought it would be a good occation to commence with a painting log here on Dakka. I've had years of very good experieces with painting logs which I see as an incredibly effective tool for keeping motivated and on the task. I'm really looking forward to read your feedback and I always strife to improve so feel free to comment. Each Thunderwolf rider comes with magnetized arms and the option of having either a power first, a wolf claw and or a close combat weapon in the left hand (one got a thunderhammer option instead of the powerfist option) and either Bolt Pistol or Storm Shield in the right hand. The Hero of the Wolf Guard has his arms glued on and comes with a Combi-Melta (yet to come), a Wolf Claw and wolftooth necklace. All this meant quite some converting. First, I had to repose the legs so they'd go on the wolves properly. 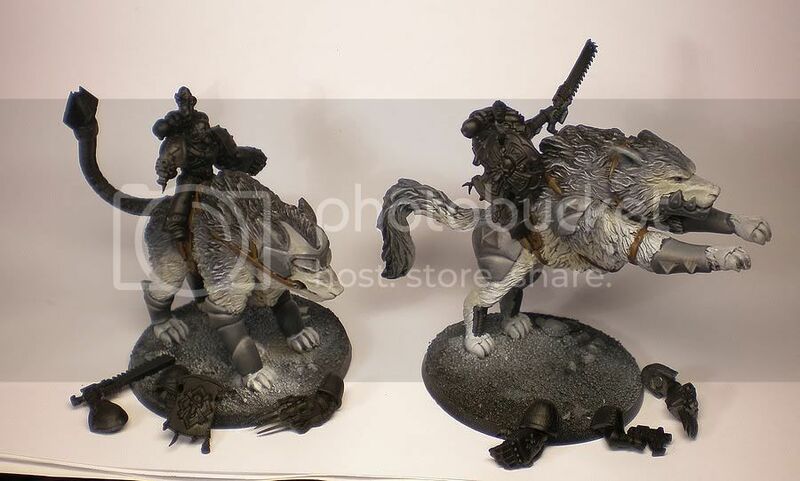 Nice enough, the Wolf minis come with legs already that fit Space Marines almost perfectly and clearly are made with Space Wolves in mind but due to the fact that the other company couldn't just sculpt Space Marines legs (due to IP and all that), they had to change them a bit so it looks more genuine to use regular SM legs. Anyway, next thing to do was swap a LOT of weapons options to other arms. Regular Space Marines seem to suffer from the same problem as their Terminator brothers - they aren't allowed to have shields and powerfists at the same time and some other restrictions in terms of weapon combinations. So I had to put all shields in other hands, convert a power fist and a wolf claw, change a Terminators storm shield to fit regular power armoured SM and so on. Anyway, now they're finished and ready to paint. 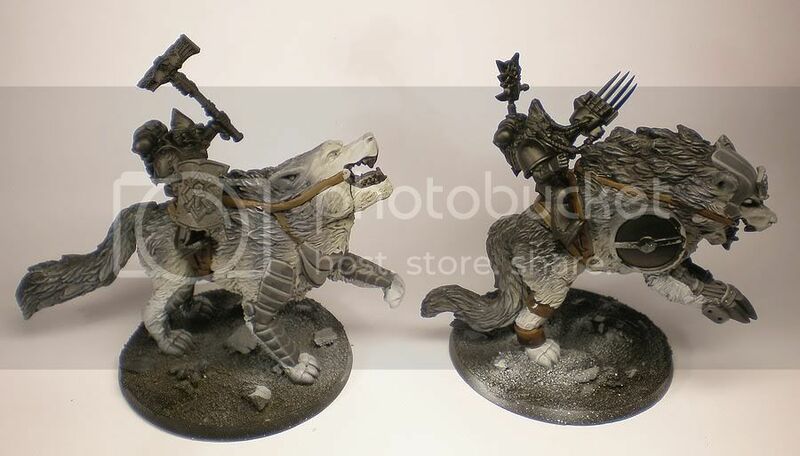 There's two more minis on Thunderwolves coming up - two Wolf Lords of which one I plan to turn into a Step-by-Step painting tutorial like I did with the Dark Elves musician some months ago. That's all for now. Thanks for having a look and I hope to read your ideas and feedback on the Thunderwolf Riders. See you soon! Looks great so far! Can't wait for more!! "Whatever happens, you will not be missed." Wolves are looking very nice and clean! Keep it up. And please post some other stuff you've made recently. Thanks muchly for the feedback, Sirs. Finished the main work on the DKoK test minis. I finally overcame my initial block of not knowing what the heck I should do for colourschemes. Today I finally did more work after some hours, I discovered that it's basically a french guy and the classic Steel Legion scheme. :p Well, little changes of course but basically that's it. That's also the reason why I painted the grey guy's pants red. How do you like them? Nothing much has changed, it just went as it usually does. I take the Nightbringer, do some more highlighting on the skin and the robes and that's it. No idea what to do with him. So much for now. Seeya later. Alright you guys, today was the last day of Vienna Model Expo 2010 which means that I did some late hours and wrote a review of the whole event including the competition I participated in (thanks to your votes!). It's really rather long and has loads of pictures but let me know if you enjoy reading it or what you'd like to read more about or if you'd prefer if I didn't spend all my time writing rambling reports about local village fairs, get my lazy bum up and paint something. Aaaanyway, here's a little update of yet new stuff! This time, assembly went more smoothly and I hope that such accidents won't happen again. DKOK testminis are practically finished, Pedro Kantor is finished. No big news on the Space Wolves because I'm not really into the thought of painting even more of those at the moment. The Space Wolves client asked me to do 19 Fenrisian Wolves as well as a Thunderwolf-mounted Wolf Lord done and delivered to him until the 10th of November but the minis haven't arrived yet so I'm not sure that this is possible to do. Facemelt!! Well, bad casting I suppose. I don't really mind. Eventhough I bought it at an LGS, I'm pretty sure GW will replace the mini if I get the blister to them, right? Awesome mate purely awesome looking forward to seeing more. (1) I know you're planning a Wolf Lord tutorial. Can you talk about how you painted the Thunderwolves themselves, as I have the models and have been looking for tips on painting them. @Manchu: Thanks for replying. About the Wolf Lord tutorial - I thought of maybe changing that to a step-by-step guide for painting Captain Sicarius. Mainly for the reason that I'm using quite a bit of airbrushing on the Space Wolves and do most of the work on the Thunderwolves with my trusty airbrush so maybe Sicarius is better suited. ad (1): As hinted before, I mainly airbrushed them. My first batch of Vallejo Model Air colours arrived the morning I started painting the Wolves so I used them basically as a testing ground for these paints. Here's what happened basically: Black primer, then I started with a 80/20 white/light grey mix and brushed the lower half of the wolves plus the "faces". (it helps to get some pictures of winter wolves for reference). Then I made a mix of white, light grey and some sandy colour for the transistion colour between the very light colour on the lower side and the darker grey on the back of the wolves. Then I used some VMA colour called "Intermediate Blue" (in fact a very nice blue-grey) for the first layer of darker back colour mixed it with black for the mid colour on the back and almost pure black for the last "stripe" on the backs of the wolves. Then some layers of drybrushing, basecoated the armoured parts on the wolves with VMC German Grey and used mixes of German Grey, Citadel Codex Grey and white for highlights (several layers, mix of edge highlighting and "realistic" highlighting). Let me know if you need the recipe for the leather. ad (2): After looking around for a loooong time, the client decided he'd have his own sculptor make some wolves using the GW wolves as base. He basically added more and longer fur and reposed some of them a bit. 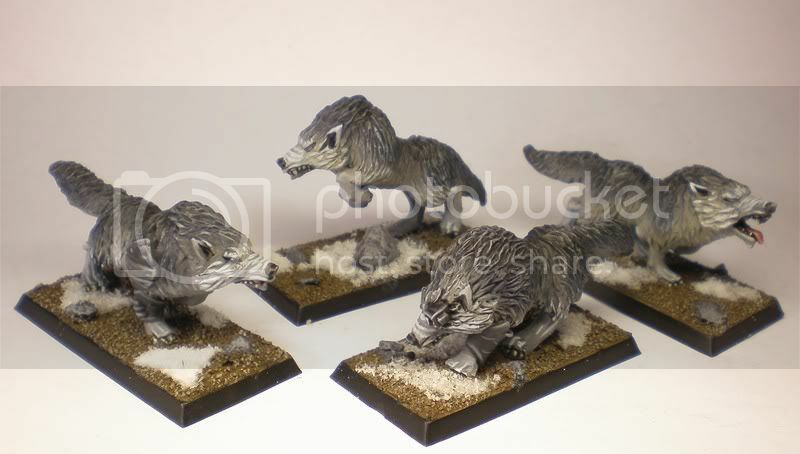 I should receive them at the beginning of the next week so pictures of the Fenrisian Wolves should follow soon. Hope that was helpful. Let me know if you need any more info. Looking good, pm me your rates, I am curious! Thank you very much for responding so quickly. I thought you were using an airbrush but I was hoping otherwise, haha. In any case, they are really wonderful and I am very inspired by them. @Manchu: No problem. I think you can do pretty well on furs and such without an airbrush as you can make up a LOT of not-so-smooth transistions with drybrushing. Or you try washes afterwards. 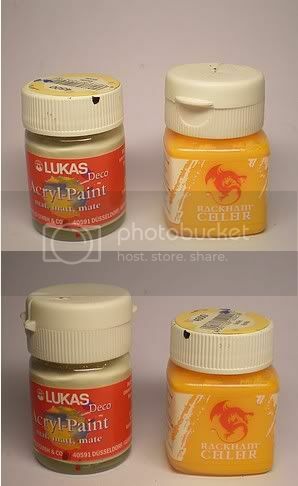 Figure A (the upper one) shows regular paintpots by the incredibly popular paint lines from LUKAS and Rackham respectively (technically, Rackham's top is a squeezy one but the worst in the world so it's better to just treat it as a screw top), in this case Vanilla and Royal Yellow. Recently I've been using Vanilla to mix with Royal Yellow for a lighter yellow. One can not EVEN BEGIN to THINK of TRYING to measure my astonishment when I noticed how I apsent-mindedly had screwed the top of the LUKAS Acryl pot onto the Rackham Color pot and it fit seamlessly! Driven by my never-ceasing thirst for uncovering the truth by bitting and piecing together bits and pieces of evidence, I took the screw-top of the Rackham pot and the Lukas Acryl pot, dead-set on undertaking a "vice versa check" (Purzelbaum, 1977). Be still, my trembling limbs...and by my first pet's grave, the TOP FIT ONTO THE POT! The bizare view of bastardicity can be seen in the lower picture (figure B). Unimaginative naysayers may mention some sort of "normed screw sizes"; a myth that was employed all to often to cover up minor conspiracies, as discovered by the magician Rollo the Third. Anyway. Interesting, eh? Seemingly unconnected companies - same screw size! Astonishing. Also, both pots seem to look way more fetching with their new tops, don't they? Yep. Both paint pots look better with the other's top. @battle Brother Lucifer: hehe, thanks. At least someone who likes him that way. 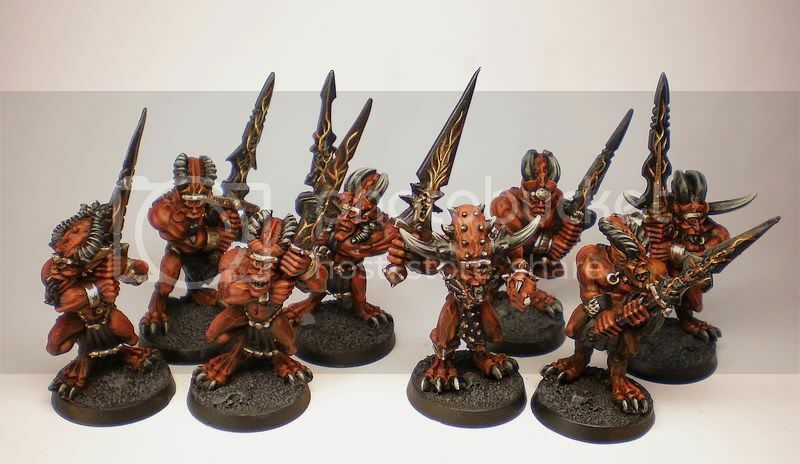 Bloodletters finished! Basing is done for the whole force altogether at a later point. 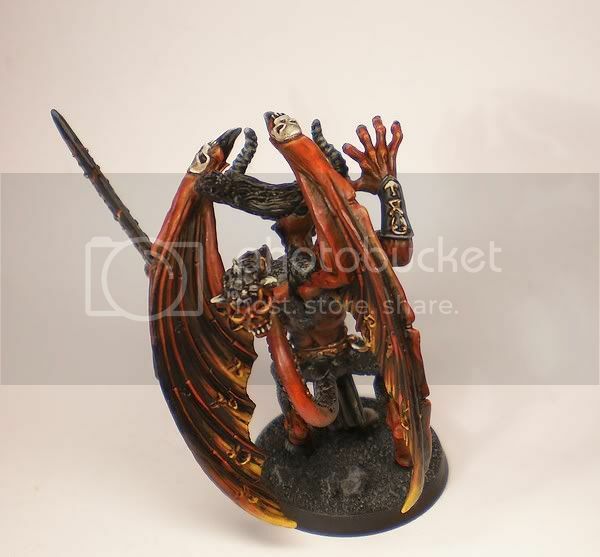 Pictures of the Daemon Prince aren't optimal, sorry about that. I have got to say I love those bloodletters and the DP! @Commander Cain: Thanks a lot, Sir. Time for watching some awesome movies, right? I started off the evening with The Hound of the Baskervilles (the Hammer Films one), later I will be joined by my brother and friends and then it's either an Italian horror film I delivberately didn't look up anything about or tons of Corman's E.A.Poe films starring Vincent Price. Now that you know about these very important facts, let's proceed. Vienna Fantasy Gaming Convention took place today and it was pretty awesome. Way less costuming and program stuff than I expected any MUCH second hand marketing. I'll upload the written report tomorrow evening I think. 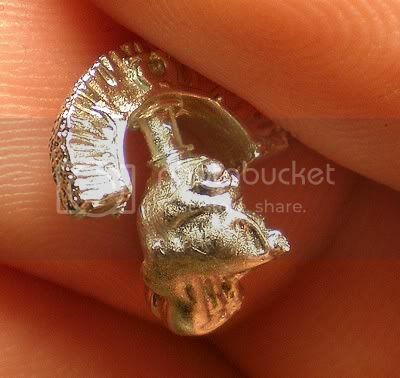 Do not fear, it won't be as long as the last one and it will be almost entirely Wargaming stuff. Sweet. These are just very nice to skim through and really inspirational. 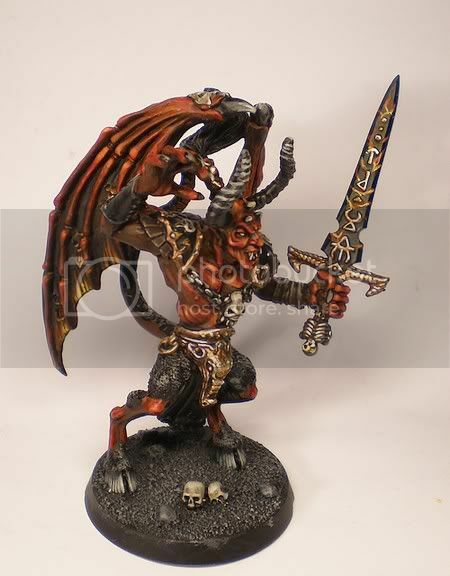 Makes me want to participate in some Golden Daemon contest or work on more scenic pieces. Oh, I also got the old Wolf-helmet Space Wolves captain. Here's what I've done paintingwise. Hope you like the design on this guy so far. Ho-hum....so let me know what you think of this guy so far. Seeya later. I am fairly weary when it comes to painting studios as minus say two or three a lot of them are well, crap. I dare say though I like these and think they will look excellent on the table. Many thanks. Would you mind sharing what you think makes a miniature painting studio or painting service crap or good? 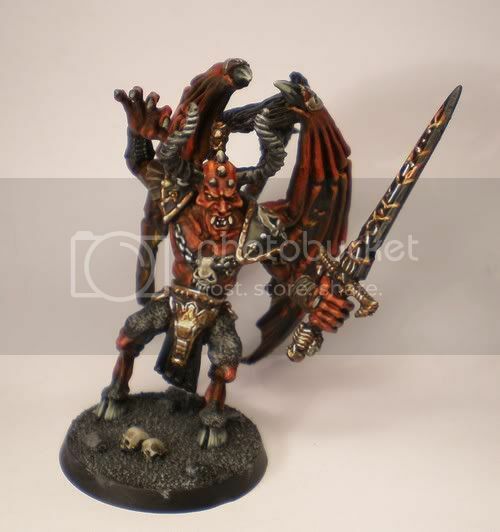 I just always like to know about people's opinions and input on miniature painting services so I can improve. Sigur wrote: Many thanks. 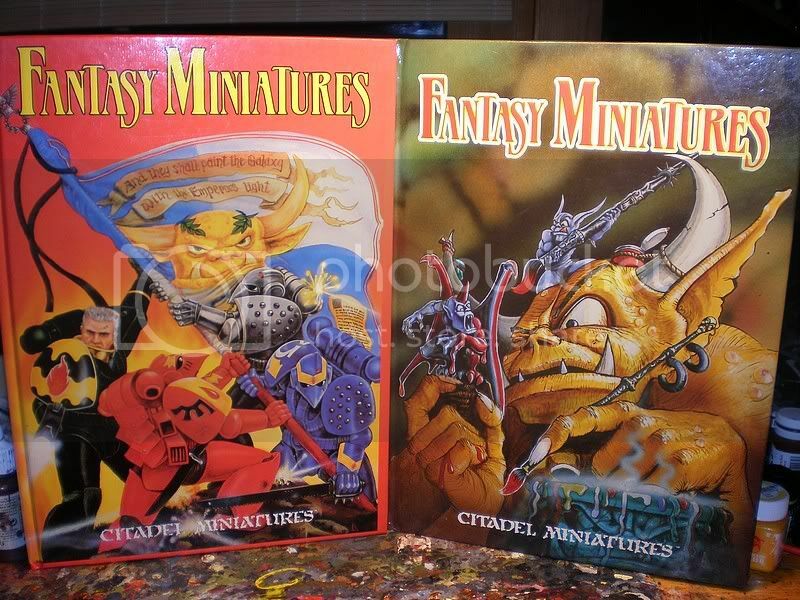 Would you mind sharing what you think makes a miniature painting studio or painting service crap or good? 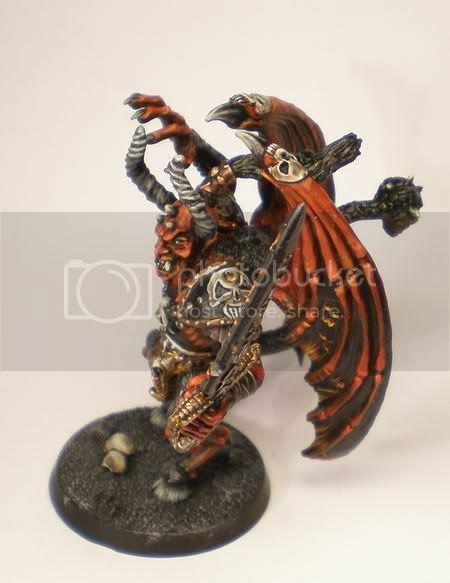 I just always like to know about people's opinions and input on miniature painting services so I can improve. I am not going to comment on who I think is good or bad, but I find it very interesting that when I do the rare commission I charge cheaper then a lot of the "studios" do, and I am a demon winner. Their quality is usually one or two layers no real blend just start contrast and people praise their work. 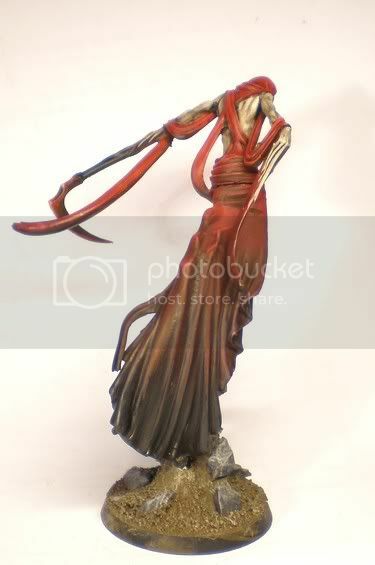 Their are some people on this forum (not naming names) who fall into this category and it blows my mind that they get a lot of contracts for comissions but their work is easy to do and little thought or feel into it, and people fan favorite them like they are gods gift to painting. Their are several really good overall companies out there, like http://www.golempaintingstudio.co.uk/. or one that has really improved in their overall quality http://www.artmasterstudio.co.uk/. These companies produce some quality at a resonable price, but some people produce.. well junk. Anyways, back to Sigur. 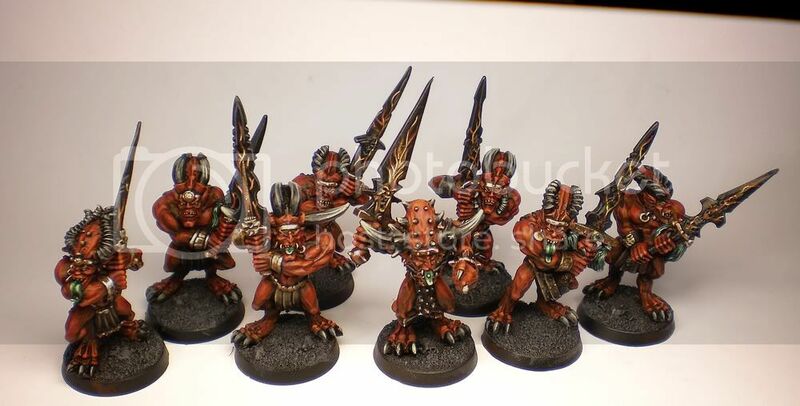 Those bloodletters are fantastic, I love the subtle blending on the skin, as well as the horns. The green is also a nice touch. I'll be watching this for more works! @Empchild: Thanks for your thoughts on the topic. I never really made any distinction between a regular painting service and "studios"; the latter probably means that they have more than one painter which in my case isn't the case really. I think I'm pricing reasonably. 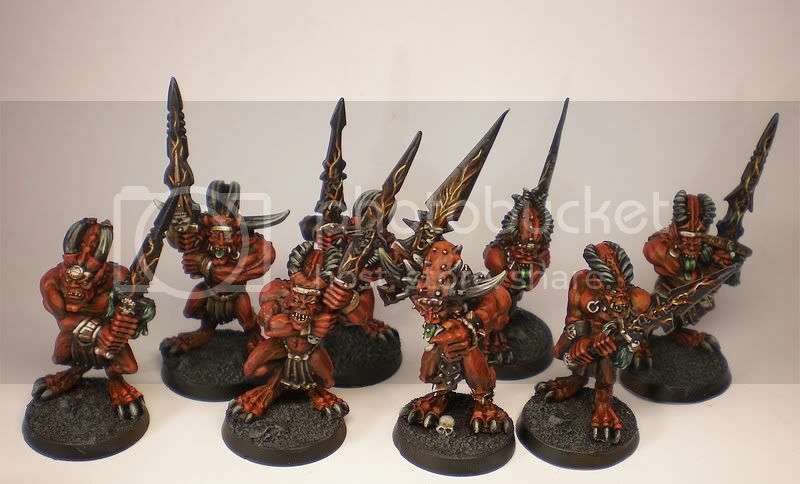 There's some insanely cheap painting services around who deliver probably okay results if the client is looking for 3-colours-based kind of paintjobs but I don't really see the appeal in that for either side. I genuinely love what I'm doing and I feel bad when I'm forcing myself to paint miniatures in a way that doesn't meet the standards I usually paint at just because a client wants to save money and IF someone decides to fork out the cash for getting his minis painted, he or she should get them painted properly right away. This will make for a way better result in the end and I don't think he or she will ever regret it. I'm not coming down too hard on painting services who deliver "junk" as you put it because those don't tend to be around for long. 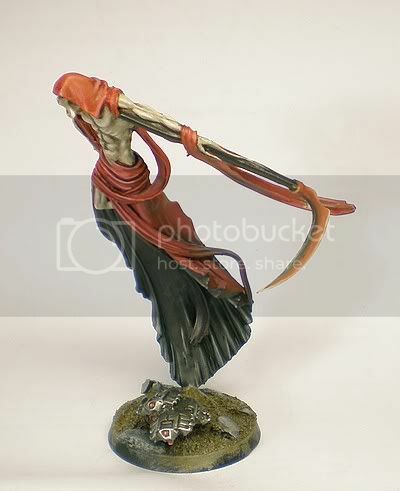 People who want their miniatures painted usually don't go for the first and cheapest service they find. They compare and gather information which usually eliminates the junk-services right away. What concerns me more is severe under-pricing for "okay" paintjobs and I don't see what this achieves. 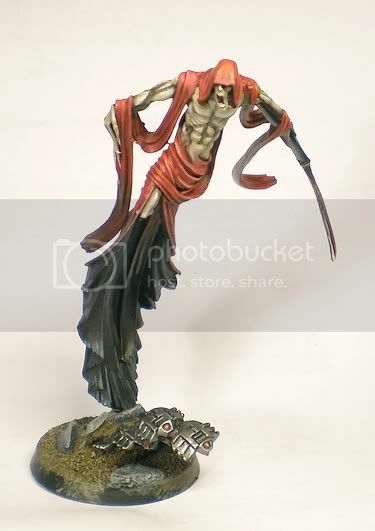 There can't be much non-monetary gratification in it for the painter(s) because the minis look merely alright and they can't do it for the money alone because they just can't make much with these prices. I just don't get it. Apart from that, I spend most painting time yesterday with basecoating about 20 Khorne Berzerkers and champions of Khorne. But now I have to switch projects again (sadly, I really enjoy painting these Khornites) - the Fenrisian Wolves and the first Wolf Lord have arrived along with some mission markers and the client asked if I could finished them until the 8th or so because he's got a tourney on the 10th. Challenge accepted. Quite a lot of stuff to do really and not much time at all. Wish me luck. P.S. : The first part of my review of Fantasy Gaming Convention is online. Just click the fat link in my signature. Wolves finished and based even! I really enjoyed painting these two finished markers. Mainly because I was allowed to use clear lines and nice colours on the console one, which I usually prefer to "gritty" looks and the one with the plate and the sword in the rock is just a great piece. Not so sure what I'll do about the third one yet (colourwise mainly) but I'll think of something. 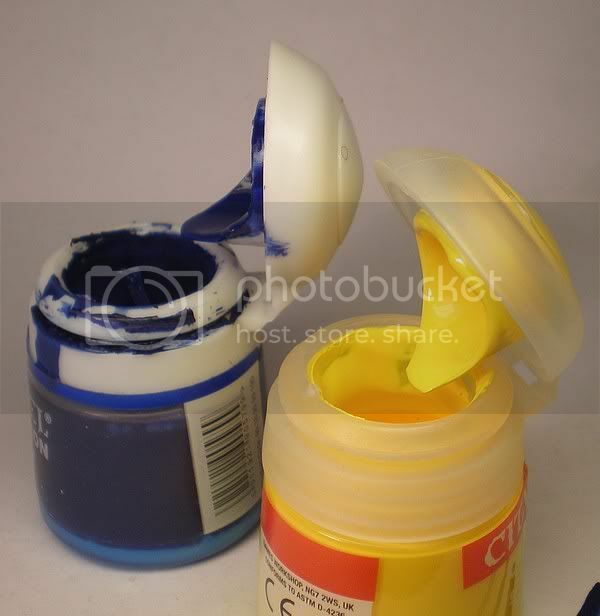 The new paint pots don't have the litte lid thingy that prevents the top from closing again. The Foundation paints pots have them, the Washes pots (even new ones with the new label and all) have it - just not the pots for the regular paint! I'm pretty sure that this phrase is overused but... WHAT WERE THEY THINKING!?. They were so incredibly close to making an unnecessary change once again but not screwing it up and now this! Also, I hate to be the guy who dismisses clear facts and simple physics/geometry but I don't believe that these tiny things hold the same amount of paint the 2003 paintpots do. And even if the pots were the same size in total, they just put way less paint into them. I got one new pot and a couple of 2003 ones and the paint level in all the 2003 pots is higher than in the new pot. Anyway, enough of that rambling. I got this weekend to finish a mission marker, a Wolf Lord and maybe another Chooser of the Slain marker so I better get to it. P.S. : Did anyone of you notice a drastic change in the looks of Regal Blue in the past years? I got a new pot today and it looks completely different from what I remember it to look like. And I remember well because I really liked that colour. did you model those wolves yourself? they look amazing! Love to know where you got those wolves. Nice job on them. I am sorry i missed it reading your article, but where di you get your thunderwolves from? i still cant decide what to use ffor mine, and i like the style of yours, where can i get some? 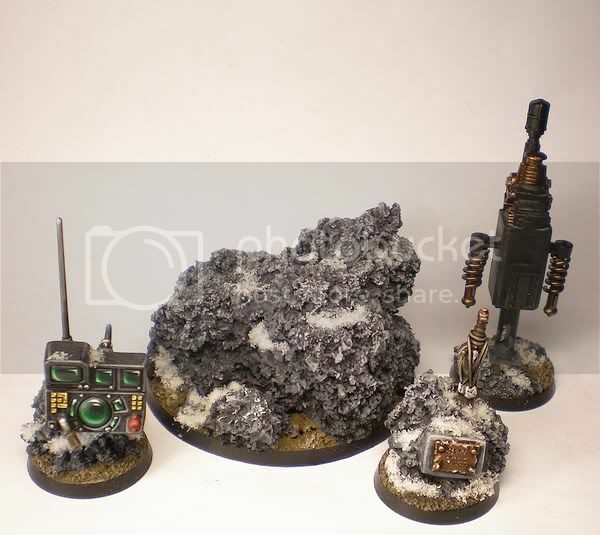 I think the third objective marker would look excellent with a dark green plating, red for the light and a Patina for the exposed metal. The other two markers are excellent, as for the paint pots I'm a little bit tired of all of the unnecessary changes they have made through the years. I think once my current paints start to run out I'll begin the process of changing over to Vallejo model color. Dropper bottles and cheaper, it works out that for every 8 I buy i'll get another for free compared to GW's stuff.